To view and set the properties for a raster layer, double click on the layer name in the map legend, or right click on the layer name and choose Properties from the context menu. This will open the Raster Layer Properties dialog (see figure_raster_properties). The General tab displays basic information about the selected raster, including the layer source path, the display name in the legend (which can be modified), and the number of columns, rows and no-data values of the raster. You can set the Maximum (inclusive) and Minimum (exclusive) scale, defining a range of scale in which the layer will be visible. Out of this range, it’s hidden. The Set to current canvas scale button helps you use the current map canvas scale as boundary of the range visibility. See Renderizado dependiente de la escala for more information. With the multiband color renderer, three selected bands from the image will be rendered, each band representing the red, green or blue component that will be used to create a color image. You can choose several Contrast enhancement methods: ‘No enhancement’, ‘Stretch to MinMax’, ‘Stretch and clip to MinMax’ and ‘Clip to min max’. This selection offers you a wide range of options to modify the appearance of your raster layer. First of all, you have to get the data range from your image. This can be done by choosing the Extent and pressing [Load]. QGIS can Estimate (faster) the Min and Max values of the bands or use the Actual (slower) Accuracy. Now you can scale the colors with the help of the Load min/max values section. A lot of images have a few very low and high data. These outliers can be eliminated using the Cumulative count cut setting. The standard data range is set from 2% to 98% of the data values and can be adapted manually. With this setting, the gray character of the image can disappear. 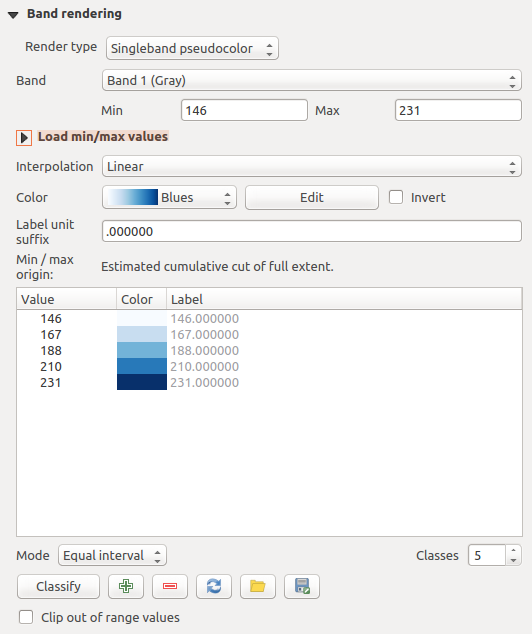 With the scaling option Min/max, QGIS creates a color table with all of the data included in the original image (e.g., QGIS creates a color table with 256 values, given the fact that you have 8 bit bands). You can also calculate your color table using the Mean +/- standard deviation x . Then, only the values within the standard deviation or within multiple standard deviations are considered for the color table. This is useful when you have one or two cells with abnormally high values in a raster grid that are having a negative impact on the rendering of the raster. If you want to view a single band of a multiband image (for example, Red), you might think you would set the Green and Blue bands to “Not Set”. But this is not the correct way. 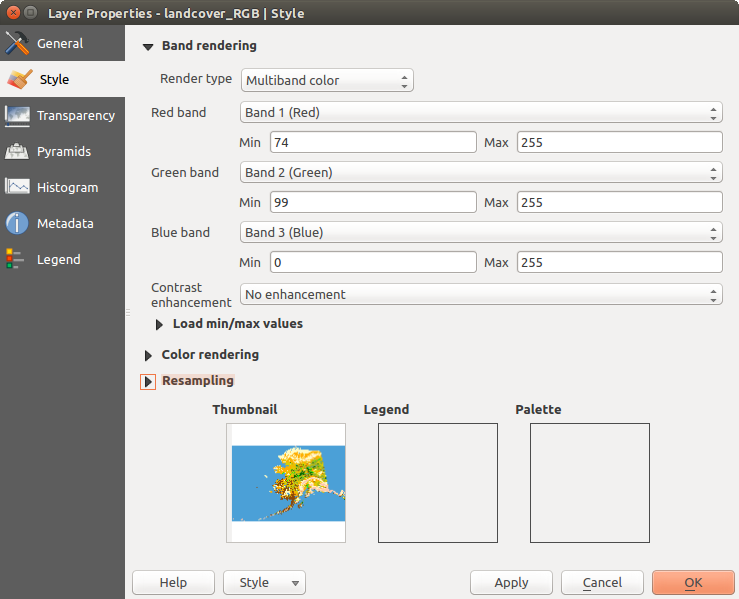 To display the Red band, set the image type to ‘Singleband gray’, then select Red as the band to use for Gray. This renderer allows you to render a single band layer with a Color gradient: ‘Black to white’ or ‘White to black’. You can define a Min and a Max value by choosing the Extent first and then pressing [Load]. QGIS can Estimate (faster) the Min and Max values of the bands or use the Actual (slower) Accuracy. With the Load min/max values section, scaling of the color table is possible. Outliers can be eliminated using the Cumulative count cut setting. The standard data range is set from 2% to 98% of the data values and can be adapted manually. With this setting, the gray character of the image can disappear. Further settings can be made with Min/max and Mean +/- standard deviation x . While the first one creates a color table with all of the data included in the original image, the second creates a color table that only considers values within the standard deviation or within multiple standard deviations. This is useful when you have one or two cells with abnormally high values in a raster grid that are having a negative impact on the rendering of the raster. In the left block, the button Add values manually adds a value to the individual color table. The button Remove selected row deletes a value from the individual color table, and the Sort colormap items button sorts the color table according to the pixel values in the value column. Double clicking on the value column lets you insert a specific value. 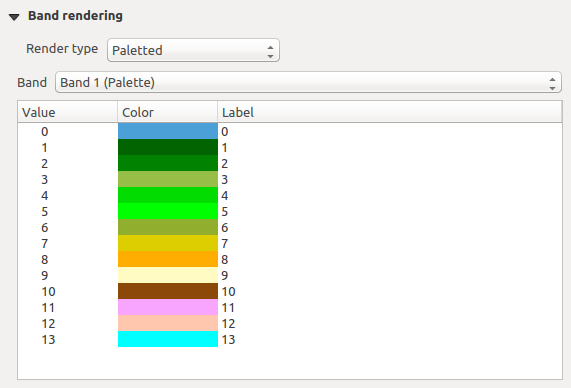 Double clicking on the color column opens the dialog Change color, where you can select a color to apply on that value. Further, you can also add labels for each color, but this value won’t be displayed when you use the identify feature tool. You can also click on the button Load color map from band, which tries to load the table from the band (if it has any). And you can use the buttons Load color map from file or Export color map to file to load an existing color table or to save the defined color table for other sessions. In the right block, Generate new color map allows you to create newly categorized color maps. For the Classification mode ‘Equal interval’, you only need to select the number of classes and press the button Classify. You can invert the colors of the color map by clicking the Invert checkbox. In the case of the Mode ‘Continuous’, QGIS creates classes automatically depending on the Min and Max. Defining Min/Max values can be done with the help of the Load min/max values section. A lot of images have a few very low and high data. These outliers can be eliminated using the Cumulative count cut setting. The standard data range is set from 2% to 98% of the data values and can be adapted manually. With this setting, the gray character of the image can disappear. With the scaling option Min/max, QGIS creates a color table with all of the data included in the original image (e.g., QGIS creates a color table with 256 values, given the fact that you have 8 bit bands). You can also calculate your color table using the Mean +/- standard deviation x . Then, only the values within the standard deviation or within multiple standard deviations are considered for the color table. You can also achieve special rendering effects for your raster file(s) using one of the blending modes (see Modos de Mezcla). At the bottom of the Style tab, you can see a thumbnail of the layer, its legend symbol, and the palette. 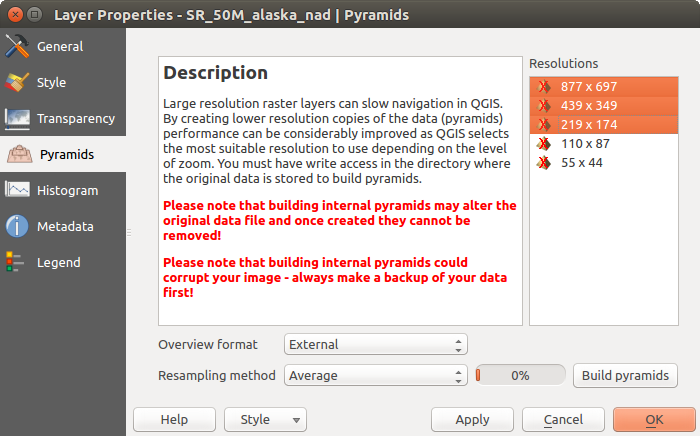 QGIS has the ability to display each raster layer at a different transparency level. Use the transparency slider to indicate to what extent the underlying layers (if any) should be visible though the current raster layer. This is very useful if you like to overlay more than one raster layer (e.g., a shaded relief map overlayed by a classified raster map). This will make the look of the map more three dimensional. An even more flexible way to customize the transparency can be done in the Custom transparency options section. The transparency of every pixel can be set here. 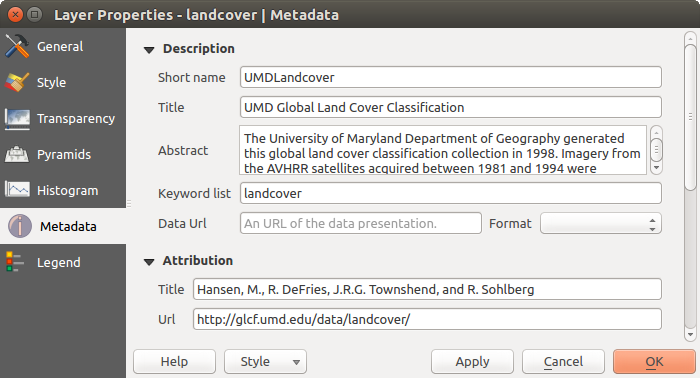 Load the raster file landcover.tif. Open the Properties dialog by double-clicking on the raster name in the legend, or by right-clicking and choosing Properties from the pop-up menu. From the Transparency band drop-down menu, choose ‘None’. Enter the raster value in the ‘From’ and ‘To’ column (we use 0 here), and adjust the transparency to 20%. Press the [Apply] button and have a look at the map. You can repeat steps 5 and 6 to adjust more values with custom transparency. Finally, click [Build pyramids] to start the process. 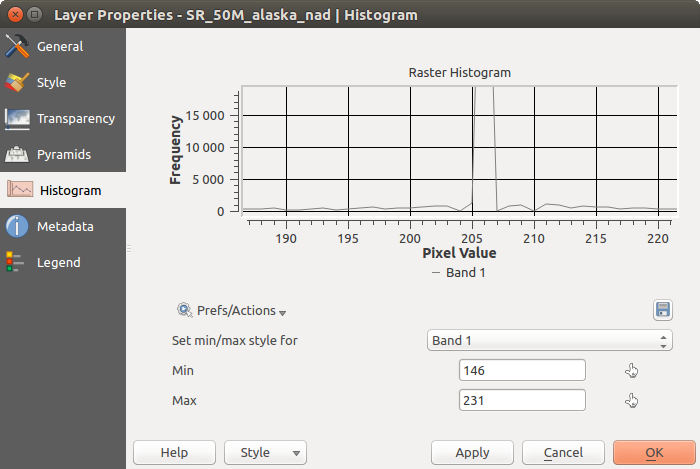 The Histogram tab allows you to view the distribution of the bands or colors in your raster. The histogram is generated automatically when you open the Histogram tab. All existing bands will be displayed together. You can save the histogram as an image with the button. With the Visibility option in the Prefs/Actions menu, you can display histograms of the individual bands. You will need to select the option Show selected band. The Min/max options allow you to ‘Always show min/max markers’, to ‘Zoom to min/max’ and to ‘Update style to min/max’. With the Actions option, you can ‘Reset’ and ‘Recompute histogram’ after you have chosen the Min/max options. The Metadata tab displays a wealth of information about the raster layer, including statistics about each band in the current raster layer. From this tab, entries may be made for the Description, Attribution, MetadataUrl and Properties. In Properties, statistics are gathered on a ‘need to know’ basis, so it may well be that a given layer’s statistics have not yet been collected.